Oh No… My Cat needs to visit the vet! Very few cats actually enjoy visiting the vet… many will do a disappearing act even at the mention of the word ‘vet’ or the arrival of the dreaded cat basket! Then, with the challenging task of fitting the suddenly enormous and multi-legged creature into the travel basket, followed by a car ride accompanied by the sounds and smells of distress, it is not surprising that many cat parents are reluctant to bring their pet in for check ups. Sadly, as cats are also good at hiding the fact that they feel unwell, matters may be serious before they see the vet. At Macqueens, we do all we can to make our feline patients comfortable. We are a Gold Standard “Cat Friendly Clinic” in recognition of our commitment to the best of care for our feline patients. Our team have all been trained in approaching and handling cats sensitively and respectfully. 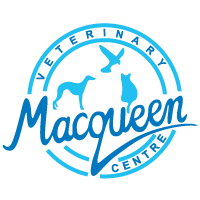 We have a separate Cat Waiting area, Cat-only clinics, a peaceful, dedicated cat ward with large cages and a high standard of feline equipment. Choose a robust front and top loading carrier that is easy to clean. Make the carrier part of the furniture with comfy bedding, treats and keep it covered with a blanket. Spray Feliway (calming pheromone) into the carrier 30 minutes before using it. Cover the carrier with a familiar blanket, secure it in the footwell and carry it carefully.